Adopt-A-Pet This June at PRISM Studio! 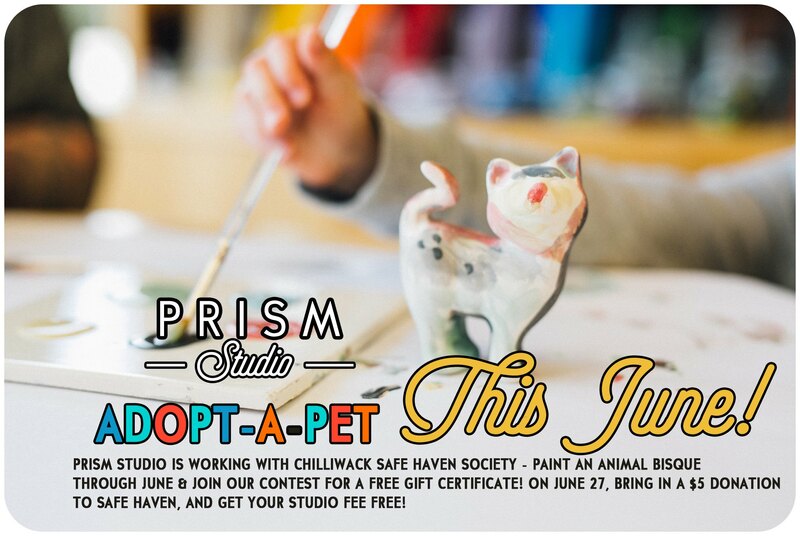 This June PRISM Studio is partnering with Chilliwack Animal Safe Haven for Adopt-A-Pet! Come into the Studio and paint an animal of any kind, whether it be a figurine, a bank, a mug or onto a plate and enter our Adopt-A-Pet contest. We will take a photo of you with your animal and a chalkboard with your pet’s name and adoption date. The photos will be posted to our Facebook page from July 5-11 for voting, the photos with the most likes after the week will win a PRISM Studio Gift Certificate! During the month of June, whether you paint an animal or not, you will have the opportunity to donate to Chilliwack Animal Safe Haven. The Chilliwack Animal Safe Haven Society is dedicated to saving homeless cats, helping pets stay in loving homes, and cultivating respect and awareness for the rights and needs of animals. We believe adoption is vital; abandoned cats desperately need loving homes. But we cannot merely “adopt” our way out of the homeless animal problem. We must also reduce the number of animals at risk. There’s an old saying that the ultimate goal of animal shelters is to put themselves out of business — to realize the dream of a day when there are no more homeless cats. If every community reduced the number of animals at risk, we would be much closer to achieving that dream. Our Give Back day will be on Saturday, June 27 and instead of bringing in 2 cans of food per painter, we ask you to donate $5 to Chilliwack Animal Safe Haven for a FREE Studio Fee!! We are always open till 10pm on Saturdays.